Have you ever thought of replacing the eternally square ice-cube by an ice sphere? That’s exactly what the Matte Black 2.75’’ Cirrus Press can do. Thanks to this machine, there will be a lot less water in your drink! A sphere is the geometric shape that occupies the least space. Therefore, there is less contact between the ice and the alcoholic drink, and of course, less contact means less dilution. Conceived first and foremost to cool spirits like scotch or whisky, the ice sphere has been a great success among cocktail buffs. The Le Matte Black 2.75’’ Cirrus Press makes an ice ball of approximately fifteen centimeters. And because it takes quite some time to melt, the sphere can last through multiple beverages. 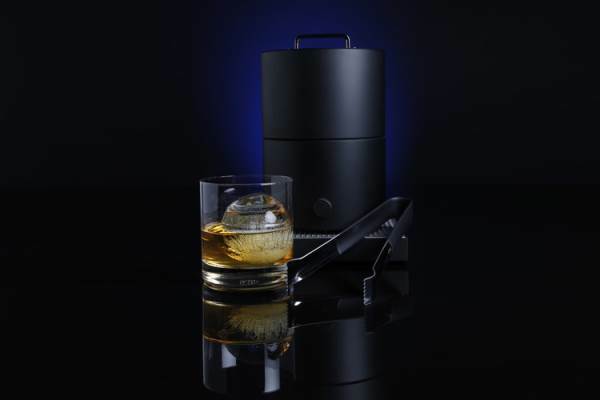 Sold for close to $850, this machine, made of solid anodized aluminum and stainless steel, is built to last for a long time, just like your passion for spirits and cocktails.